Turkey’s failed coup, combined with the disastrous disunity and polarization in the United States thanks to Barack Obama, have gotten people talking about whether it could happen here. For example, part-time law professor and full-time Instapundit Glenn Reynold has recently taken some serious looks at the issue of coups within the context of the American system of checks and balances. So what if next January Obama and his barely post-puberty band of juice box screw-ups in the West Wing decide they don’t want to leave? And the issue is even more pressing with Donald Trump sneaking up in the polls – Nate Silver gives him a 34% chance of winning, which is up from the approximately 0% chance a whole bunch of people gave him a year ago, your author included. If a couple more disgruntled cop haters with totally obvious unknown motives and a few more [OMITTED] radicals go on kill sprees, Trump might well be our next president. So, could Barack Obama pull off a coup to keep himself in power rather than turn over the keys to the Oval Office? Of course not. At the outset, what makes you think he would suddenly become competent enough to pull off that kind of sophisticated scheme, especially with him leading from behind the wheel of the Ivy League clown car that is his administration? These twits can’t even beat a bunch of Bedouin banditos sitting out in the open in the middle of a desert. But it never pays to rely solely on the incompetence of your opponents, so let’s run through a scenario and see how it plays out. Donald Trump gets elected, snatching Pennsylvania, Ohio, and Michigan from Hillary when the people liberals have spent the last half-century dumping on get mad and vote. Gracious as always, Trump’s victory speech promises that Attorney General Chris Christie’s first job will be to investigate and prosecute Pantsuit von Pervenabler and President Faily McWorsethanCarter. That gets Obama’s attention faster than a delicious doggie at dinner time. His post-presidency plans involve sucking up the residual adulation of the idiots who love him; they don’t involve dodging subpoenas and maybe even indictments. Hillary, after she sobers up, calls him and shrieks that he has to do something. Obama quickly says, “Valerie, it’s for you” and hands over the phone, but it’s quite clear – this whole peaceful transition of power thing just can’t happen. Plus, he tells himself, the rule of law is racist anyway. And so the coup plotting begins. Now, a coup is generally a small group of people quickly seizing power, often bloodlessly. This is in contrast to a civil war, which is usually neither quick nor bloodless. In the American system, it would likely mean one part of the government (here, the executive) moving to essentially unmoor itself from the checks and balances of the other branches. In other words, it would be Obama doing what he has tried to do for the last eight years, except with guns. So, how does one pull off a coup in the United States? It’s actually harder than it appears. A coup by definition is covert – you have to try and keep the active force as small as possible to maintain secrecy yet still have enough assets to do the job. The problem for Obama is that a significant portion of the most important element, the military, has nothing but contempt for him. Assume the good captain passes that manifestly unlawful order to his troops (My own captains would have assumed that I had stuck my head and politely dragged me away to get an MRI). So, then Sergeant First Class Jones and most of the rest of the company NCOs would report that some unexplained maintenance problem had rendered most of the unit’s vehicles deadlined. “Oh well, sir,” he’d say, shrugging. The military runs on NCO power; when they stop playing, you don’t have an army anymore. You have a bunch of government employees sitting around dressed like shrubs. But assume the military does act. What’s it do? How about seize the prime media outlets? Well, there would be no need to seize many of them– the New York Times and the alphabet networks would cheerlead a coup. But the others? Which of the thousands of radio and TV stations would they grab? And how about the internet – where do the soldiers go to take over the internet? Mark Zuckerberg’s hacienda? And there’s another problem – Texas, plus a bunch of other states with administrations that still have an affinity for that wacky old Constitution of ours. How do you imagine Governor Abbot reacting to Obama informing the nation that he thinks he’ll just stick around for a while, only without those meddling kids in Congress? Probably not so well. Governor Abbot has most of an infantry division that works for him. All the other loyal governors have forces too. And, it being their home, those local boys and girls will fight. Speaking of fighting, that brings us to one more little obstacle in the road to Coupville. That’s us – the American people. 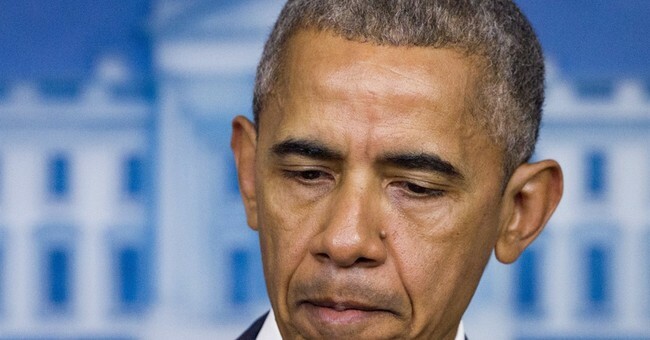 It’s been Obama’s greatest disappointment that he has been unable to crush and humiliate the decent patriots of this country who keep and bear arms for the defense of themselves, their families, their community and – oh yeah – the Constitution. Disarming us isn’t just fun; it’s a strategic necessity for a coup to work. But American patriots buy 60,000 firearms every single day. That’s four infantry divisions worth. The U.S. military has (very) roughly the equivalent of 25 active and reserve infantry and armored divisions. Their troops’ dubious loyalty to some usurper president aside, that means every week loyal Americans arm themselves in numbers in excess of the basic ground combat forces of the U.S. military. This is not the place to dispel the tiresome assertions of some Twitter keyboard commandos who argue that small arms in the hands of the populace can’t effectively oppose a modern army. They would not be the guys who had to run resupply missions across a state like Pennsylvania that was filled with several million ticked off deer hunters packing 30-06s. But let me just share a few words with you on that subject: Vietnam. Iraq. Afghanistan. So, in the end, Obama will leave in January, and good riddance. Wargaming the possibility of the elite trying to retain its grip on power is an amusing exercise, but in the end, it’s those damn bitter clingers who would once again mess up the liberals’ scheme. Of course, we know those bitter clingers as something else – patriots.